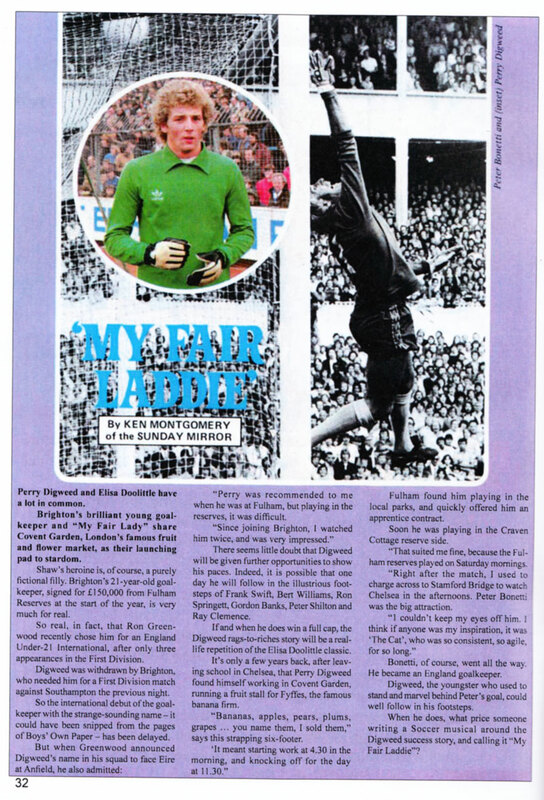 The opportunity of playing First Division football as Brighton’s first choice goalkeeper seven days after playing in front of a meagre 400 spectators for Fulham reserves left Perry Digweed with no doubts about leaving Craven Cottage. “I’d asked for a move about a month before. I’d only played in a handful of first team games in five years and felt the time had come for me to establish myself somewhere. 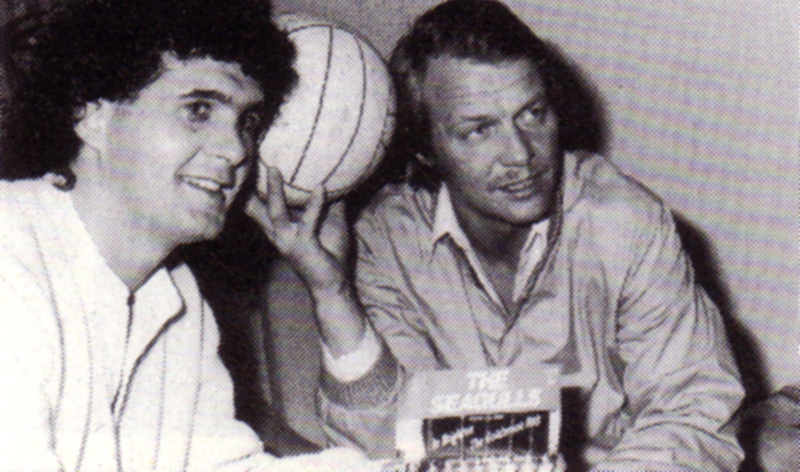 “I was a little surprised to join a First Division club,” Digweed admitted, “although I had read that Brighton were interested in me.” But even though Digweed conceded two goals against West Bromwich Albion on his First Division debut and his 16th League appearance, Alan Mullery felt his new ‘keeper had justified the £150,000 gamble he had taken in plucking Digweed out of obscurity. 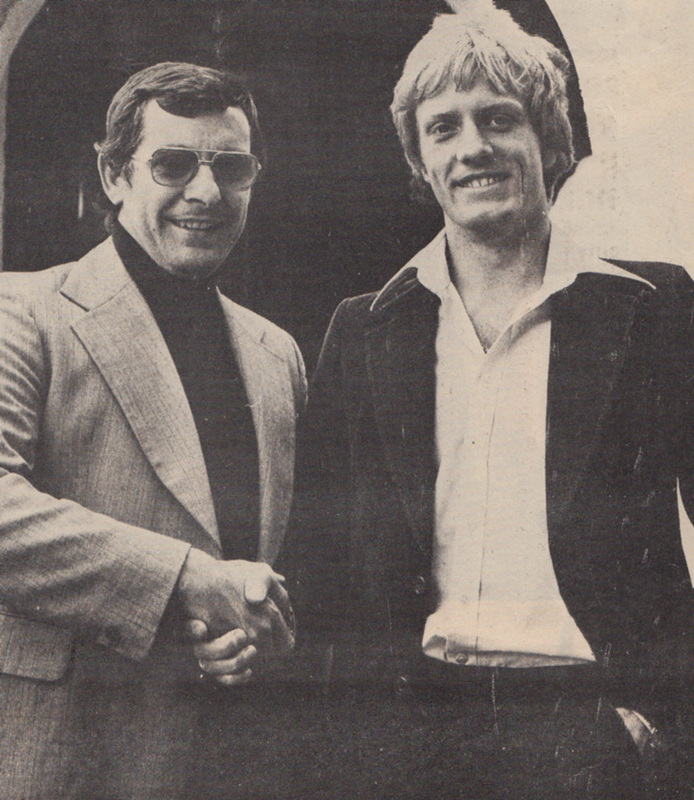 “Obviously we were after the best when it became clear that Graham Moseley was costing us vital points, but neither Peter Shilton nor Ray Clemence were available, which is why we had to look to the future,” Mullery explained. “OK, so the lad was at fault with the first goal he let in, but his overall debut convinced me more than ever that we’ve signed someone who’s going to become a very good ‘keeper,” Mullery commented. 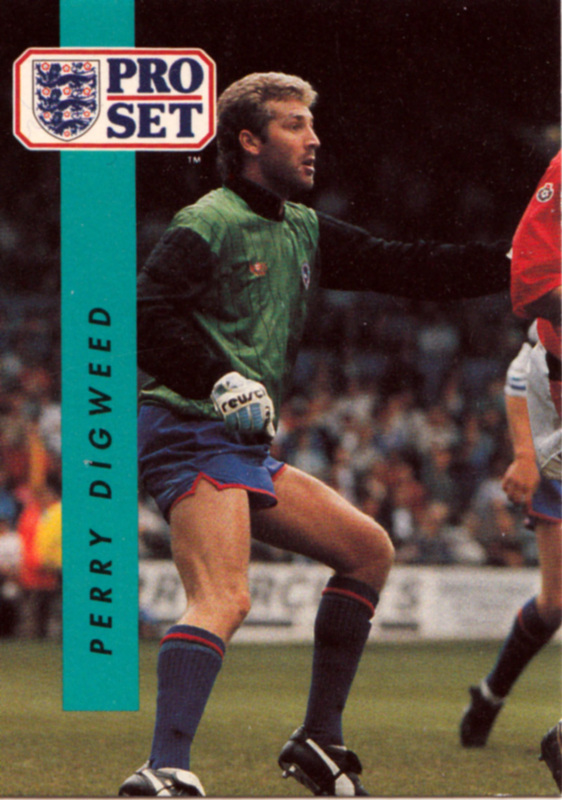 And as if to confirm Digweed’s rapid arrival at the top, he was recently called into the England Under-21 squad for the game against the Republic of Ireland. “He had to withdraw from the squad due to League commitments, but although he could not hide his disappointment, Perry was undoubtedly encouraged by his sudden arrival in the limelight. 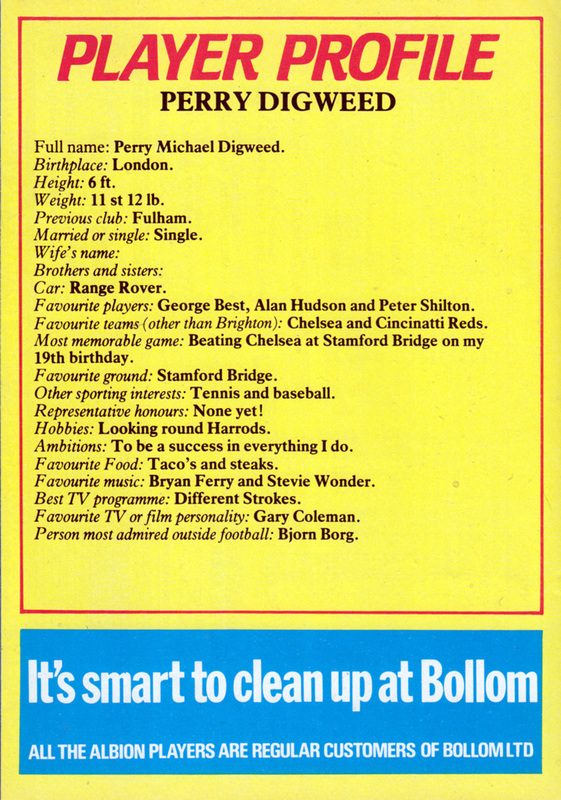 Digweed, who lives just a stone’s throw from Stamford Bridge, has always been an avid Chelsea supporter and is confident that he will be playing against his heroes in the First Division next season. 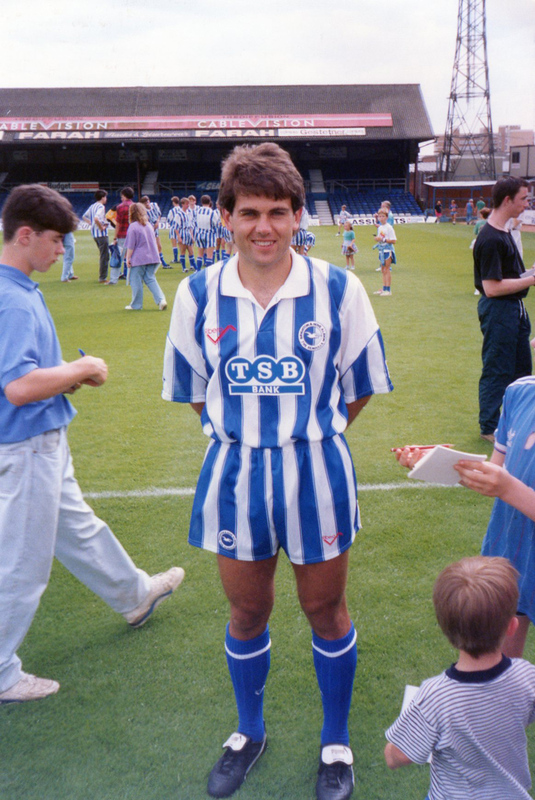 “Of course it will take time for me to adjust to the First Division, but it hasn’t taken me long to settle with Brighton as they’re such a young team. This is why there’s such a terrific spirit in the club, which makes me feel that once we’re established in the First Division we must be candidates for European football,” Digweed predicted. 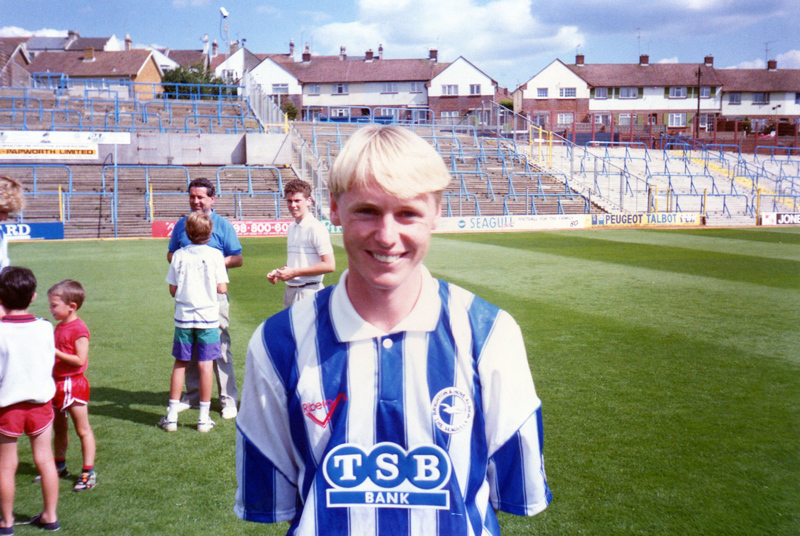 Moving to Brighton has also enabled Digweed to rejoin Brighton’s assistant manager Ken Craggs, who was largely responsible for Digweed joining Fulham. “My uncle, who played for Hounslow, is a great friend of Ken’s, and because of this, started training with Fulham when I was 13. Eventually Alec Stock saw me play and signed me up. “It baffles me how Fulham have slipped so quickly,” Digweed continued. “They’ve always played attackinq football and should have pulverised some sides. Their problem has been that they haven’t scored many goals which is, after all, what the game’s about. “It doesn’t worry me that I’ve joined a struggling club, because there is so much difference between playing here and the reserves. While my immediate aim is to help Brighton maintain their place among the elite, my main aim is to play for England,” Digweed stressed. 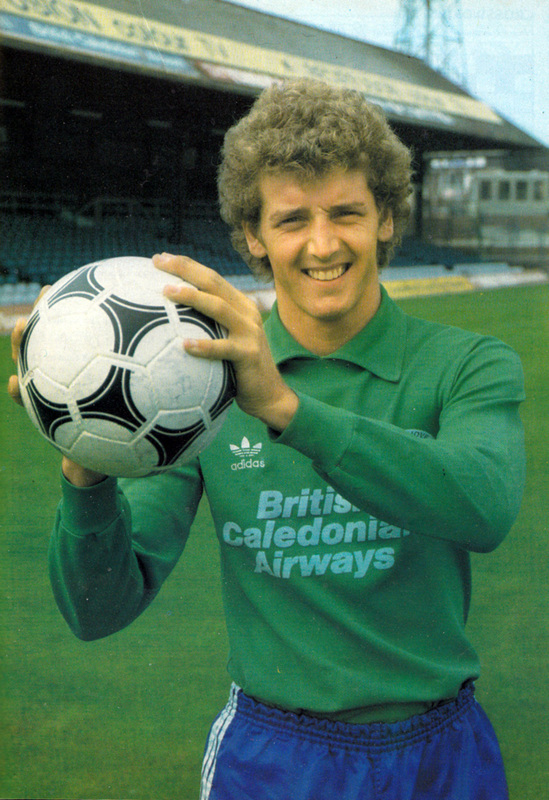 Digweed wrestled the first team keeper’s jersey from Graham Moseley, and ended up playing fifteen of the last sixteen matches of the 1980/81 season. However, when Mike Bailey took over the following season, the ex-Fulham player found himself back in the reserves again. 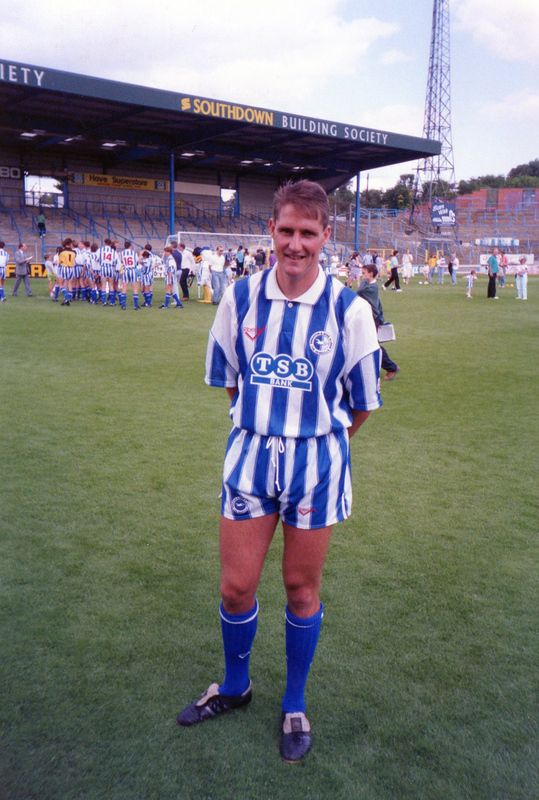 Nevertheless, he had the distinction of playing in both the famous victories at Anfield in 1981/82 and 1982/83 and remained with Albion into the 1992/93 season. 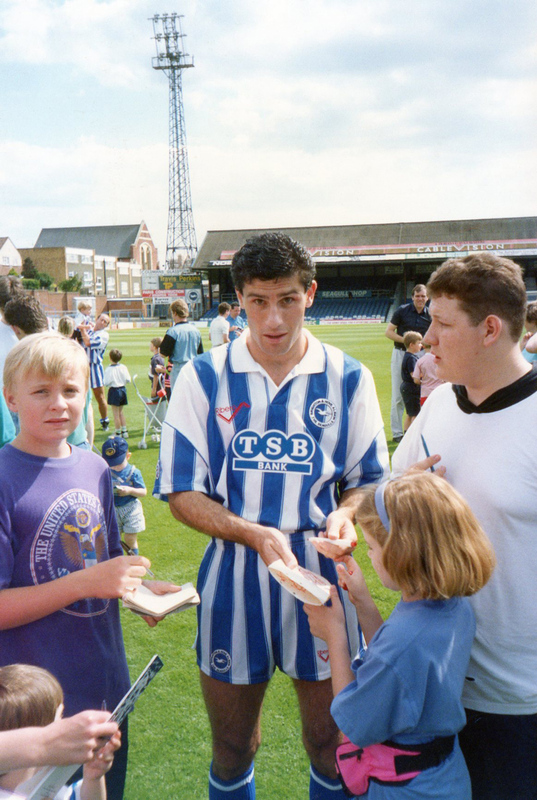 Despite his long service for the club, he was not awarded a testimonial match, and was fobbed off with a ‘golf event’ to celebrate his decade at the club. 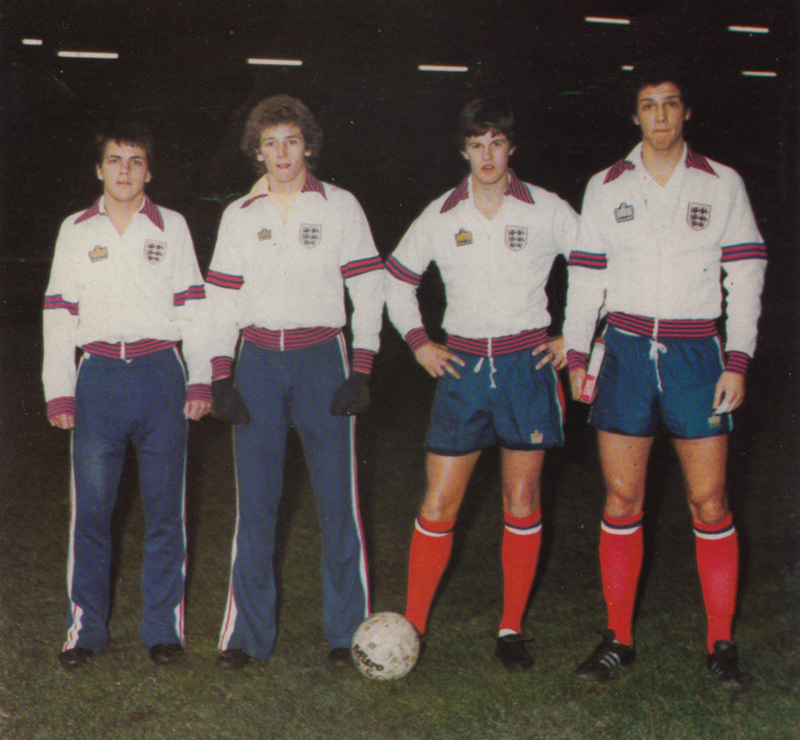 Looking for all the world like he’s dressed in a set of pyjamas, here’s a rather startled-looking Perry Digweed, second from left, showing off his Admiral England clobber along with fellow Fulham lads Mark Lovell, Tony Maloney and Tony Gale. While Brighton striker Peter Ward was banging in a famous hat-trick for England Under-21s against their Norwegian counterparts at the Goldstone around this time in late 1977, Digweed had played in the FA Youth team against Norway at Craven Cottage. 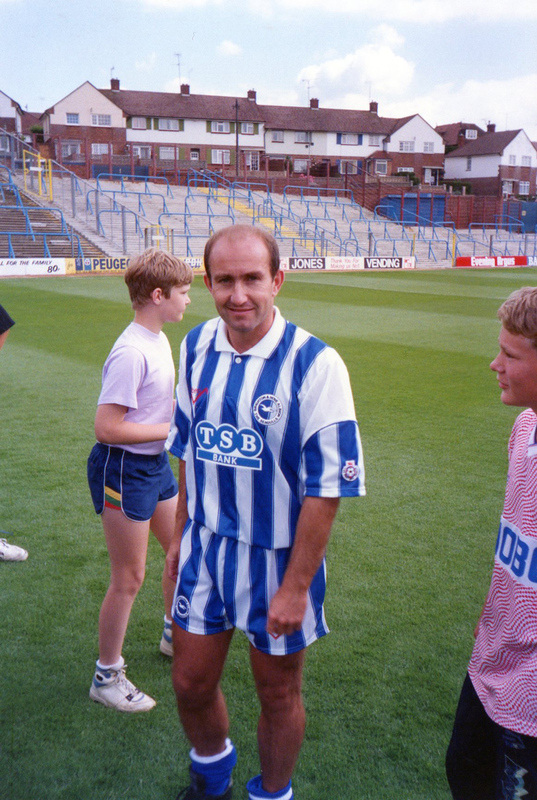 The young keeper ended up joining the Albion three seasons later in a £150,000 deal, an incredible fee for a teenage reserve goalie. Nevertheless, he repaid the faith, serving twelve years with the club. 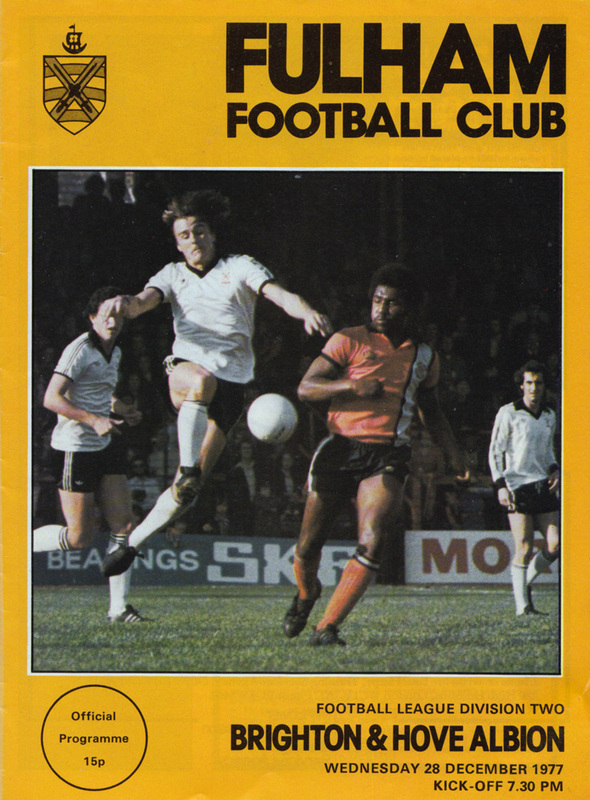 The programme has some nice tidbits, such as what a ‘TV Video-set’ for rental looked like in 1977, some colour photography of recent matches (rare at this time) and a half-time quiz asking which two former Fulham players have managed Brighton (Barry Lloyd and Micky Adams can now be added to the answers of Archie Macaulay and Alan Mullery). Some words and photos also shed some light on the lives of the Lilywhites’ assistant manager Ken Craggs and young apprentice professional Tommy Mason, 17, before they eventually arrived at the Goldstone Ground. The name of Alan Mullery is something of a legend here at Craven Cottage – and it was a sad moment both for Fulham and for English football when he decided to quit the playing side of the game at the end of the 1975-76 season. One of Mullery’s biggest assets – and some say his faults – is single-mindedness. 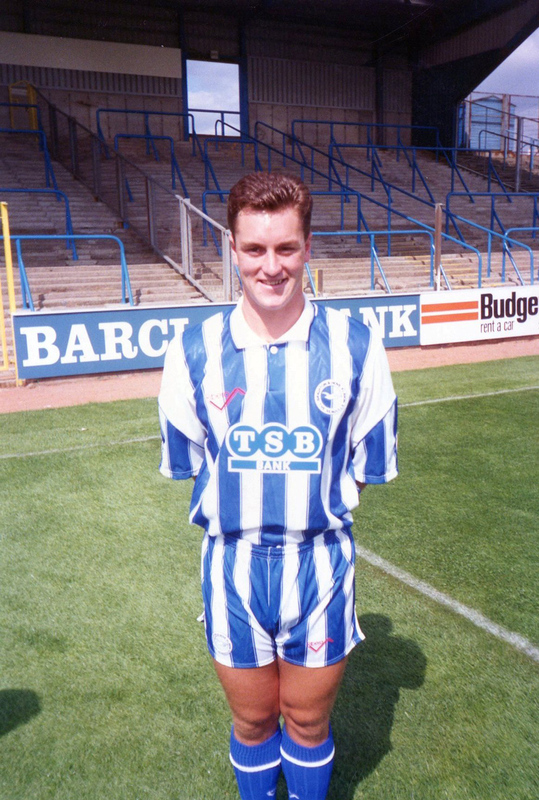 But he’s just single-minded enough to get Brighton into the First Division – and good luck to him if he does it. Fulham had been winning 2-0 when our centre-half Paul Went was concussed in a collision with Brighton’s centre-forward Ken Beamish. I told Dunne to change his role in the team until we could get Went examined at half-time, but he ignored the instruction and within minutes a ball was played over the head of a wobbly Went and Beamish scored. I argued with Dunne. He told me that Beamish wasn’t his man and so I hit him hard on the chin. 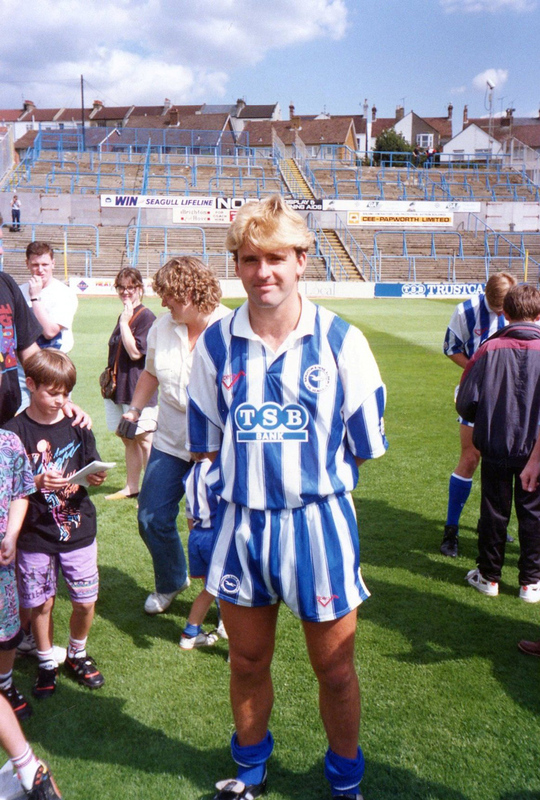 Brighton did the same a minute later only this time goalkeeper Peter Mellor made a great save and I had another go at Dunne. The argument continued in the tunnel at half-time and I smacked him a third time, until at last he saw sense and we eventually ran out 5-1 winners. 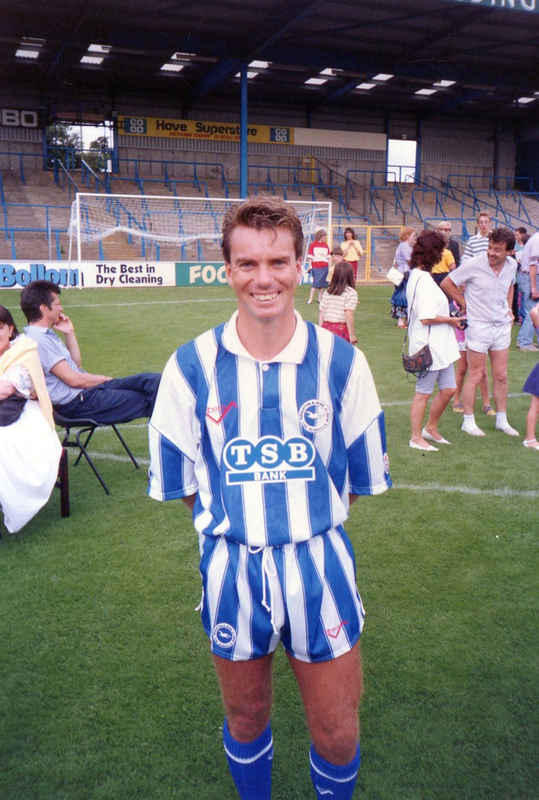 Hitting a team-mate is something I’m not very proud of, but it was done in the heat of the moment, and that first punch got me the manager’s job at Brighton. Bamber felt that if I could hit a member of my own team, nothing would stand in my way. ‘He must be a winner.’ he added as his startled wife tried to go back to sleep. 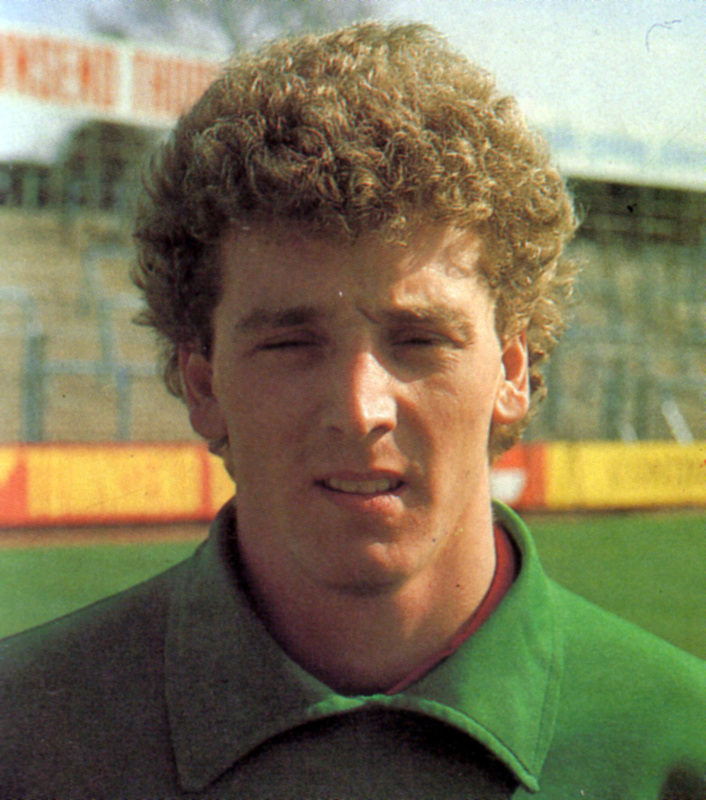 He also scored a consolation in this fixture from December 1977 against his former side. Unfortunately for him, though, the Seagulls went down 2-1. 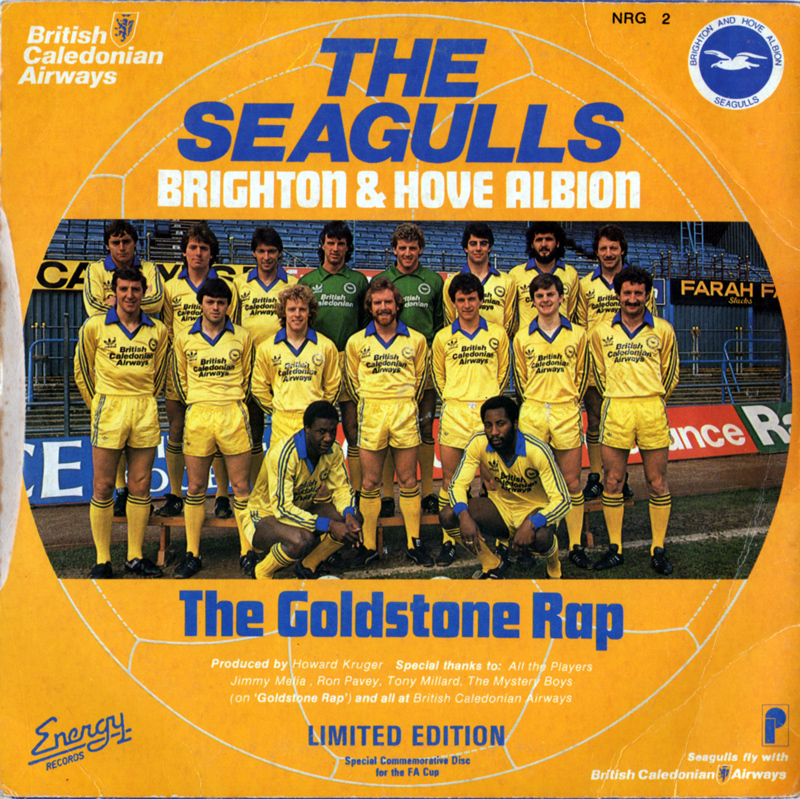 First Division footballers they may have been, but Brighton’s team of ’82 also made an audacious bid for pop fame and hip-hop credibility. Last Wednesday our first team squad had a unique day out when they travelled to recording studios in South London to cut their first record. 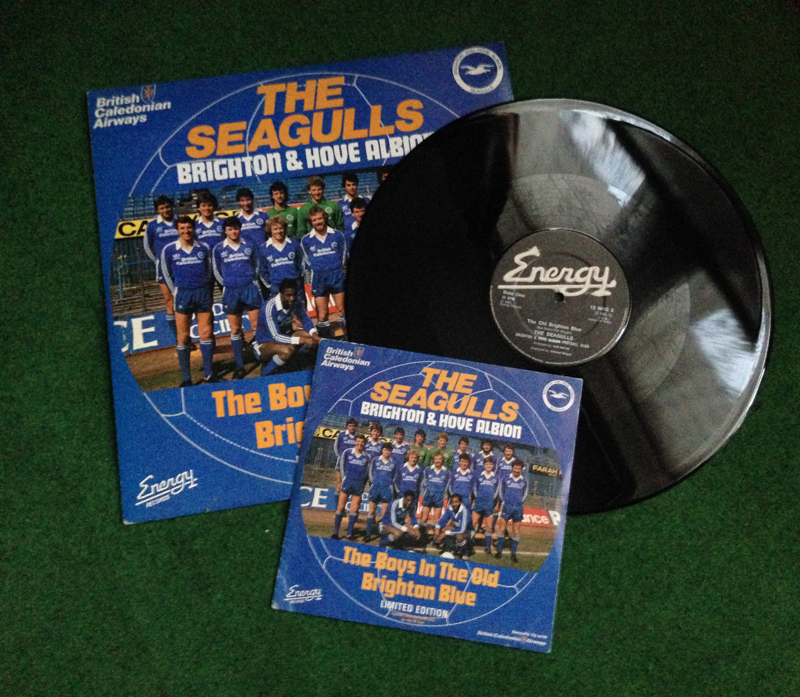 The record is entitled ‘In Brighton’ and should be available on general sale in early April. Howard Krugar, who lives in Hove and specialises in organising concerts for some of the world’s biggest stars, is the man behind the idea and he is hopeful of the disc making the charts. 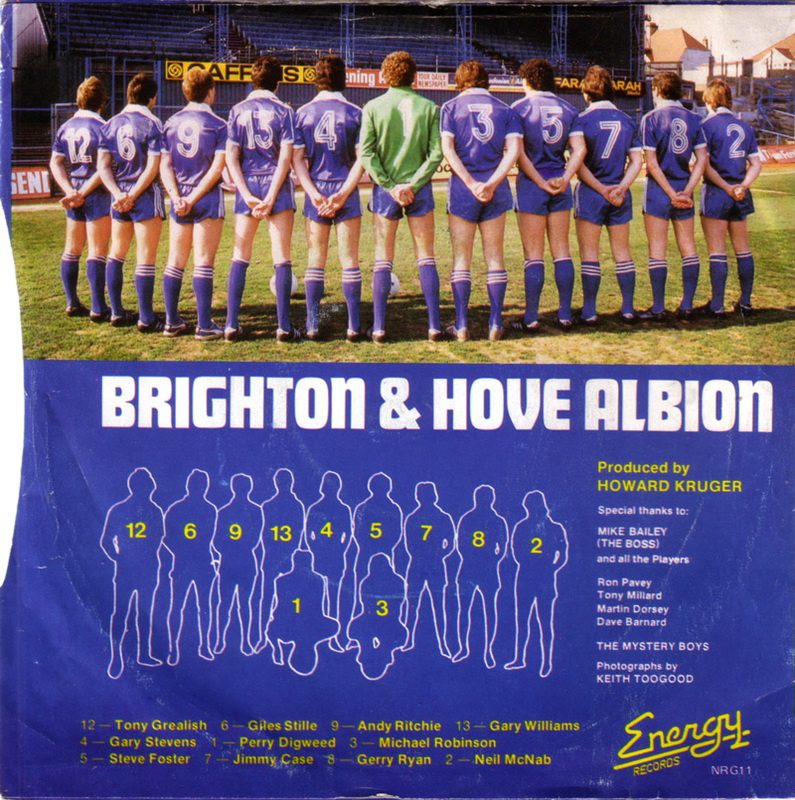 In fact it is highly likely that the Albion squad will appear on ‘Top of the Pops’. 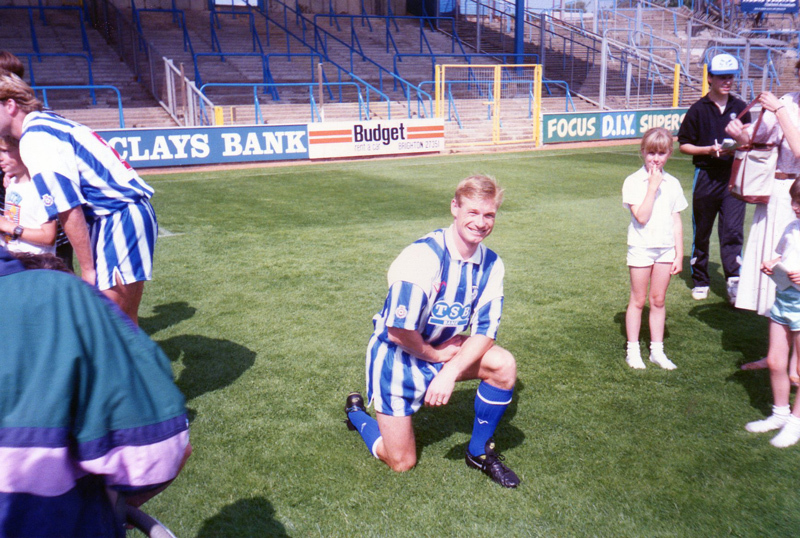 Also involved in the record is BBC football commentator Peter Brackley who livens things up with commentary on a memorable Albion goal… which one? Well, for that you’ll have to buy the record. Based on the Drifters’ song ‘On Broadway,’ the song received a positive response from John Henty who gave it a spin at Radio Brighton on Sunday 4th April. 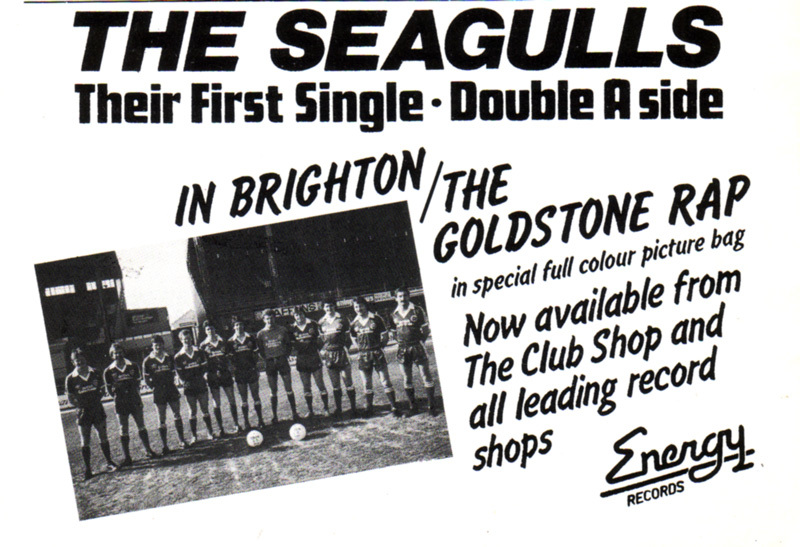 With dubious lyrics such as ‘Big Fozzie keeps it tight for Brighton’ and the boast of ‘Playin’ at the Goldstone Ground, where good football’s always found’ (sadly, no football of any kind down there now), not to mention even dodgier singing, the song probably did not have much of a fanbase outside of Brighton supporters. Last week Peter Powell played the disc on his Radio One show but allowed his own support of Wolves to colour his comments on the merits of the recording. The other track on this Double A-side was ‘The Goldstone Rap’, which this very blog you are reading takes its name from. 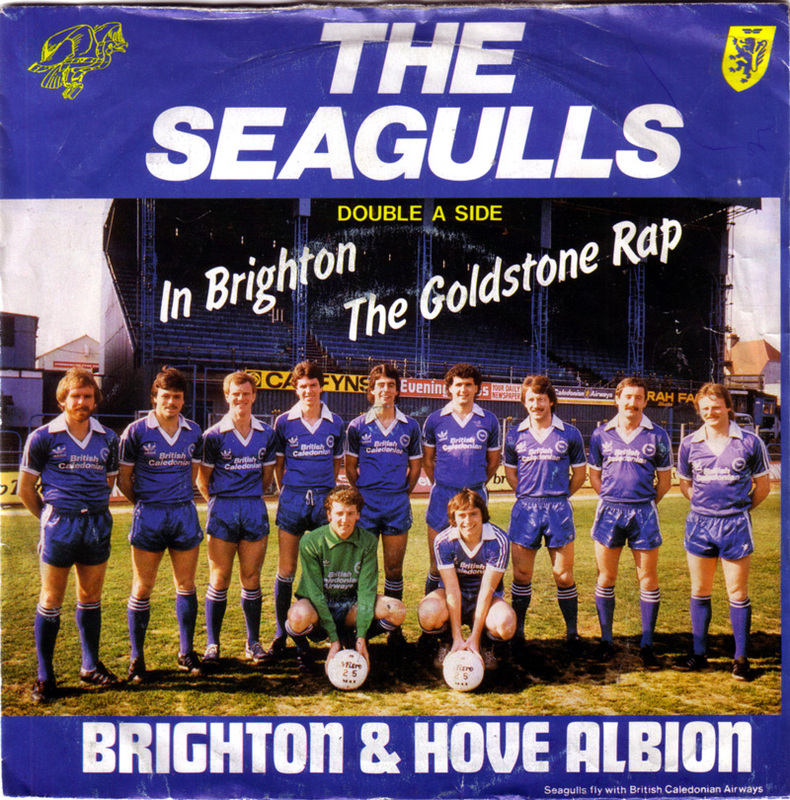 Looking at it now, it’s amazing to think that Brighton & Hove Albion were at the forefront of the UK hip-hop scene in 1982, especially as this was almost certainly the first ever football song to feature rapping. Never mind the MOBOs, though. 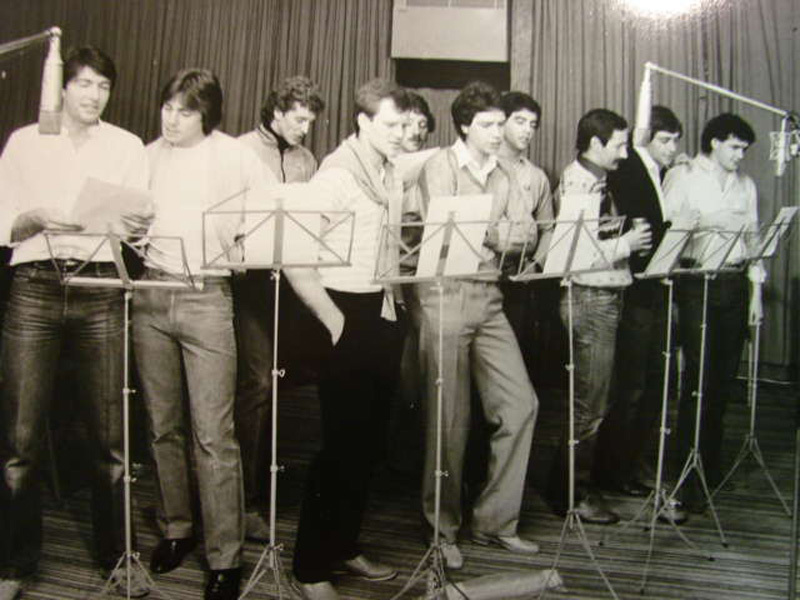 Were you at Busby’s Night Club on Kingswest, Kings Road, in Brighton on the evening of Tuesday 6th April 1982? 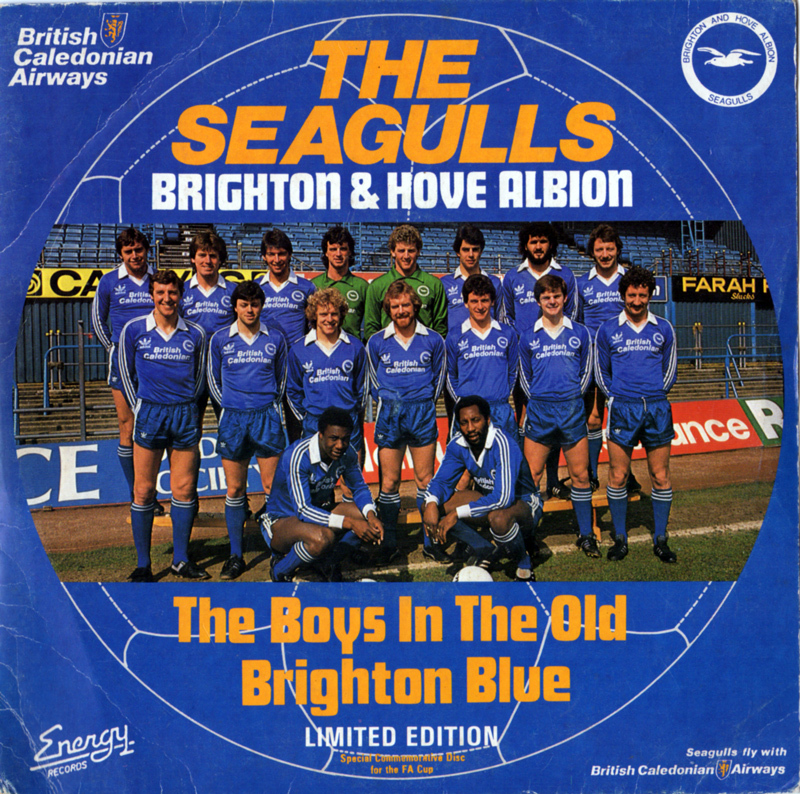 If you were, you would have been present to the grand launch of the single, as Brighton & Hove Albion’s first team squad belted out their musical masterpieces on stage! Sadly, I have no video footage of this priceless moment. The price was a bargain £1.20. Buyers of the single from the club shop were also given a chance to enter a great competition to win two tickets to Dallas, Texas, with British Caledonian Airways. Years later, I was wondering about ‘The Goldstone Rap’ and imagining what it would have sounded like if it adopted the electro sound of 1982’s other great hip-hop release, ‘The Message’ by Grandmaster Flash & The Furious Five. Thanks to the power of the internet, and due to a discussion on North Stand Chat, I got to find out. A much enhanced version, I hope you’ll agree. 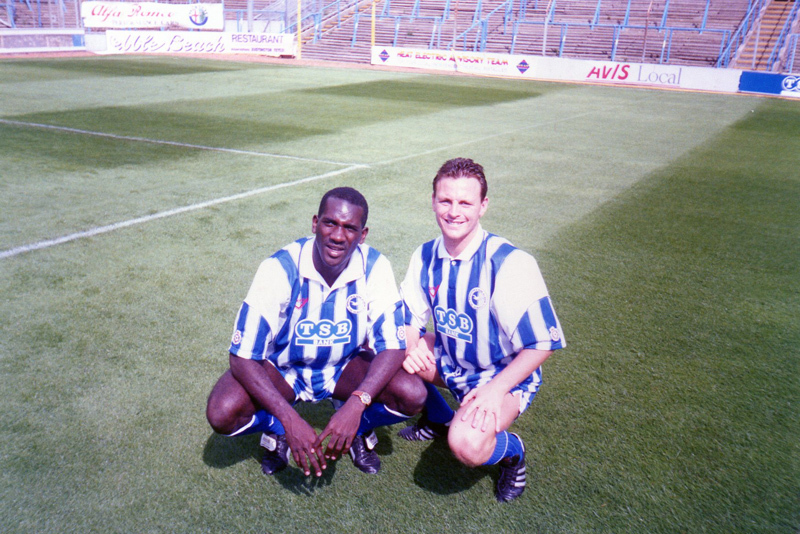 In terms of pushing at the limits of what was possible for music and Brighton & Hove Albion footballers, it was certainly close to the edge. Anyone remember collecting these cards in the early 1990s? Pro set was a Dallas company founded by Ludwell Denny. It began with a set of cards covering American football from 1989 onwards. Indeed, ‘pro set’ is the name of a formation commonly used in this sport. (After a look at wikipedia, it’s roughly a 2-1-8 formation, I think!). By the early 1990s, ice hockey and golf enjoyed the fledgling company’s card-making ways, as it made great use of the deals it had signed to gain access to extensive photo libraries. It even put together a patriotic ‘Desert Storm’ series based on the Gulf War! 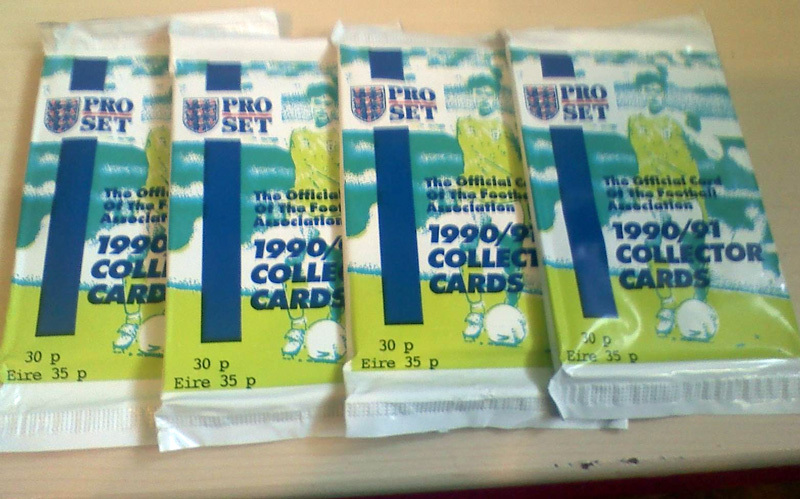 Skipping over the Atlantic ocean, in 1990/91, Pro set also launched a set of 328 cards based on the English Football League, designed to be housed in plastic wallets within an oversized binder. 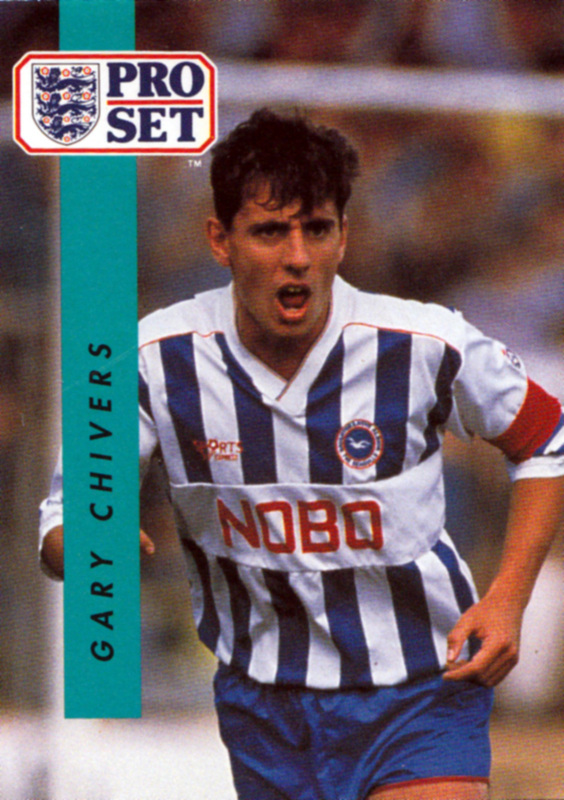 Division One clubs enjoyed thirteen or fourteen player cards each while little Brighton & Hove Albion, together with the other Second Division sides, were allocated two to four player cards. 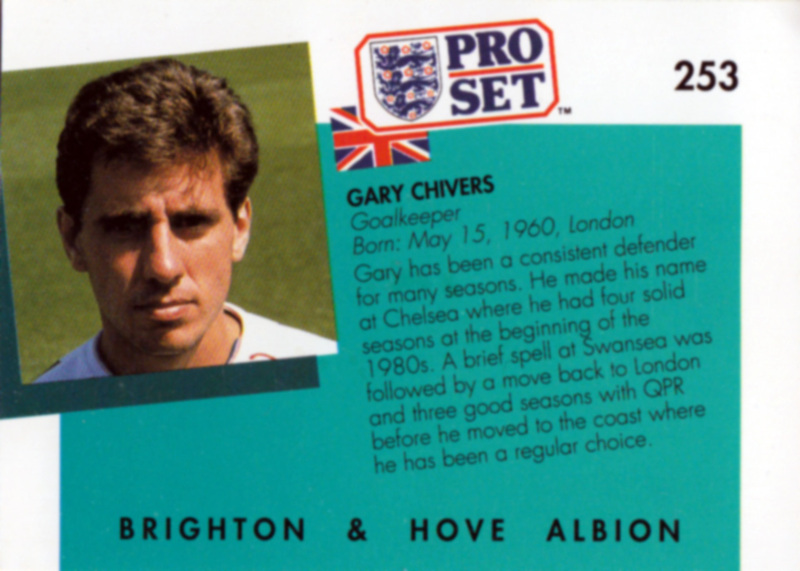 With me having been schooled in the ways of Panini, it certainly was unmistakeable that Pro set cards had a different sensibility, with the head and shoulders shot of the player relegated to the back of the card. 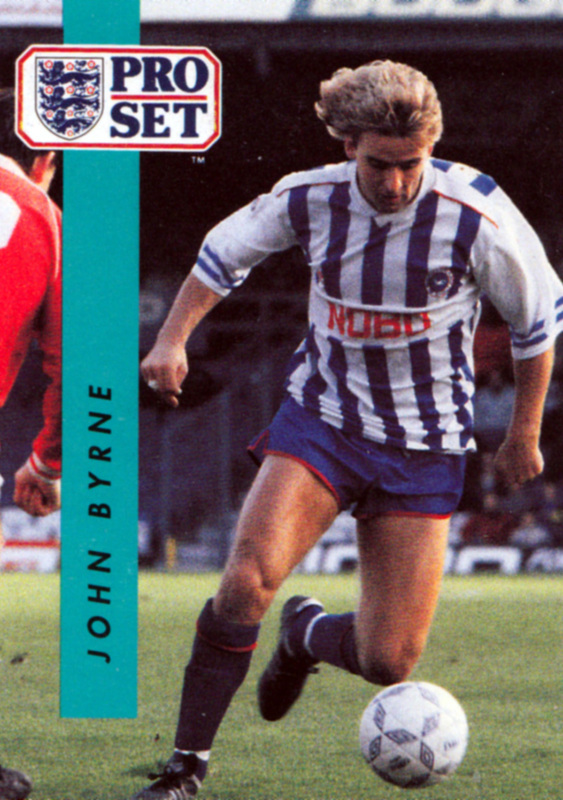 The front of the card featured a high quality borderless action shot of the player in the home or keeper’s kit (not in a tracksuit nor away shirt, unlike some other collections I could mention!) within the drama of a match. 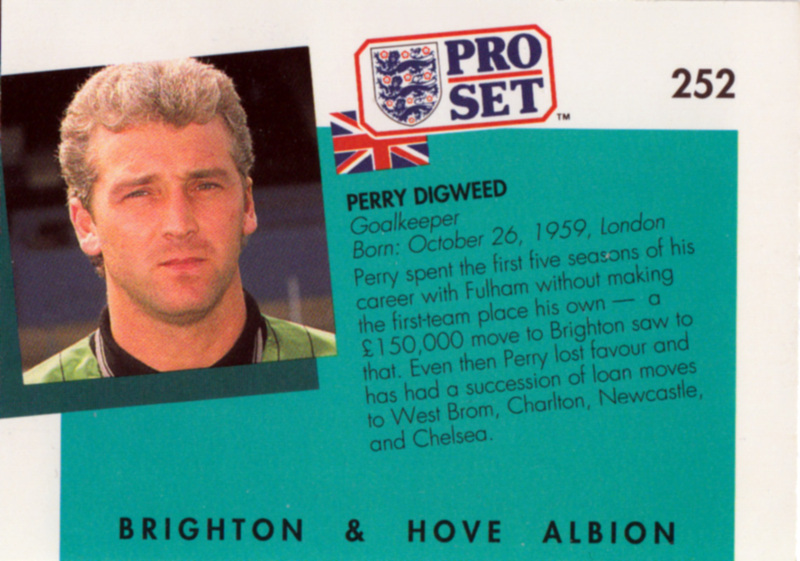 Drawing from a rich stock of images, you can also be sure that this really was Perry Digweed that you were looking at, with absolutely no photo jiggery-pokery of superimposed heads on other players’ bodies! For me, as a school child, having only really known Panini stickers and not having yet clapped my eyes on the Topps’ cards of the 1970s, it was so novel to see that players plying their trade below the top flight were getting their own individual card or sticker. 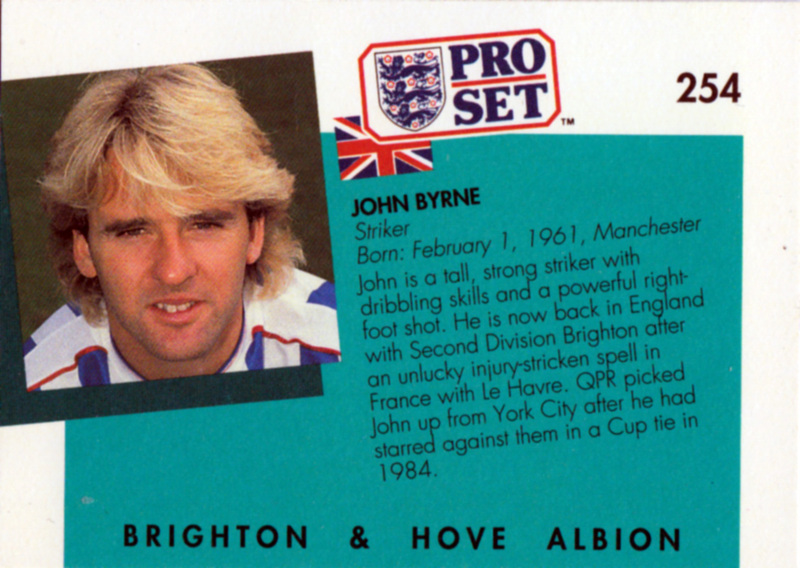 John Byrne had previously had his own individual sticker in Panini Football 86, 87 and 88, although that was, of course, with a Division One club at the time, Queen’s Park Rangers. 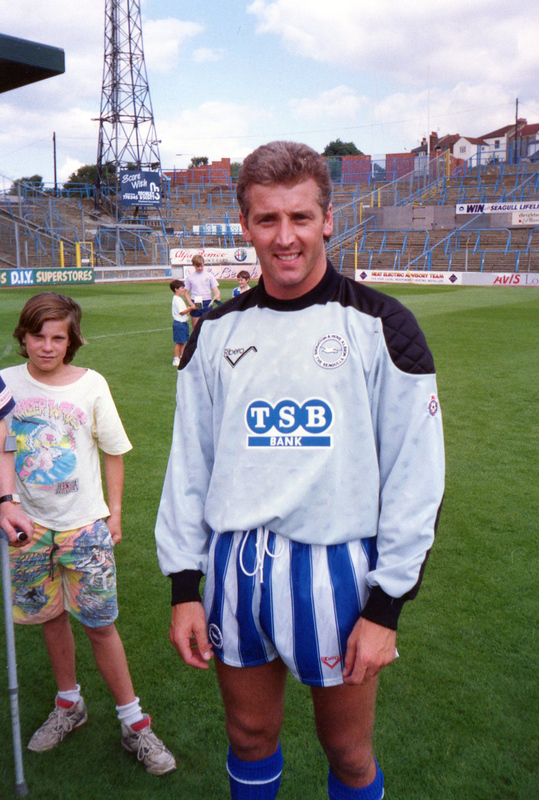 John Byrne is joined by Gary Chivers, his former team-mate at QPR, who played 42 League games during the 1990/91 season. It was a fine time for Brighton devotees to collect these cards, as our team had a great season, reaching the Play-Off Final. Had we beaten Notts County, we’d have had even more incentive to collect during the following season. As it was, I can only remember my brother and I still showing interest in them by 1991/92! Perry Digweed and Elisa Doolittle have a lot in common. Brighton’s brilliant young goalkeeper and ‘My Fair Lady’ share Covent Garden, London’s famous fruit and flower market, as their launching pad to stardom. Shaw’s heroine is, of course, a purely fictional filly. Brighton’s 21-year-old goalkeeper, signed for £150,000 from Fulham Reserves at the start of the year, is very much for real. So real, in fact, that Ron Greenwood recently chose him for an England Under-21 International, after only three appearances in the First Division.